Aerie / American Eagle – 40% off 4 tops, 30% off 3 tops, 20% off 2 tops (thru 9/17). 20% off select items with code PROMO20. Promo items can be found here. 40% off your purchase with code YESPLEASE (thru 9/19). 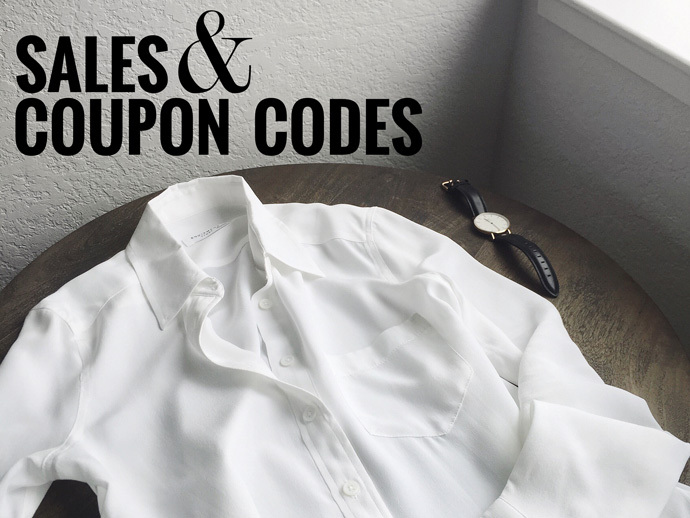 Anthro members: 20% off with a unique code delivered by email. Sign up for emails to get code. Aritzia – New fall arrivals. ASOS – Up to 60% off ‘outlet’ items. Sale can be found here. 30% off regular-price suiting & other select items (thru 9/21). Extra 40% off sale (taken at checkout) (thru 9/21). Sale can be found here. Purple Card Event: get a $25 gift card for every $250 you spend (thru 9/18). End of season sale! Up to an extra 70% off clearance items. Sale can be found here. Denim Days: 15% off 1 item, 25% off 2+ items on men’s & women’s denim (thru 9/18). Extra 20% off select sale. Sale can be found here. Shop select items from the last NYFW collection. Collection can be found here. Up to 50% off sale items. Sale can be found here. 30% off with code SOGOOD (thru 9/16). Spring sale: Up to 75% off sale items. Sale can be found here. Intermix – Up to 75% off sale items. Sale can be found here. 25% off select items with code SHOPNOW (thru 9/19). Promo items can be found here. Extra 30% off sale with code SHOPNOW (thru 9/19). Sale can be found here. J.Crew Factory – 40% – 60% off everything (priced as marked) (thru 9/19). 30% off select styles (thru 9/18). Promo items can be found here. 30% off select styles (priced as marked) (thru 9/19). Promo items can be found here. Sale. Sale items can be found here. Neiman Marcus Last Call – Season final sale. Up to 80% off select items. Nordstrom – Summer clearance sale! Up to 40% off. Sale items can be found here. Rag & Bone – Up to 50% off sale items. Sale items can be found here. Saks Fifth Avenue – Final sale, up to 75% off. Sale can be found here. New items added to sale. Sale can be found here. The Dreslyn – Sale. Sale can be found here. Extra 15% off select styles (thru 9/17). Promo items can be found here. Up to 80% off sale styles. Sale can be found here. Zara – New fall/winter arrivals.